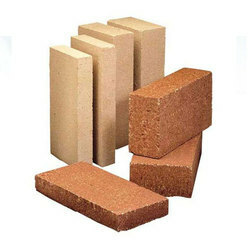 Leading Wholesale Trader of refractory bricks from Ludhiana. Dalmia’s Refractory Bricks can be put to different uses. These refractory products show characteristics like excellent resistance to spalling, abrasion, low porosity, and high refractoriness. Besides refractory bricks for cement plants, Dalmia’s range of refractory materials also includes high fire clay bricks, high alumina bricks, conventional castables, special castables, and ramming masses & mortars.